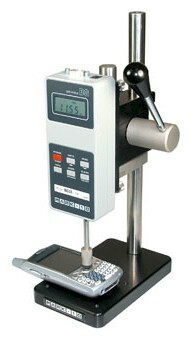 The new compact Mark-10 ES-05 test stand is designed for compression testing of up to 30 lb (150 N). Typical applications include switch contact activation testing, small spring testing, peel testing, and more. A spring-loaded lever allows for repeatable testing with up to 1.5� (38 mm) displacement.